Nick Dagan Best is a popular Canadian astrologer, blending traditional horoscopic astrology methods and modern Western techniques. 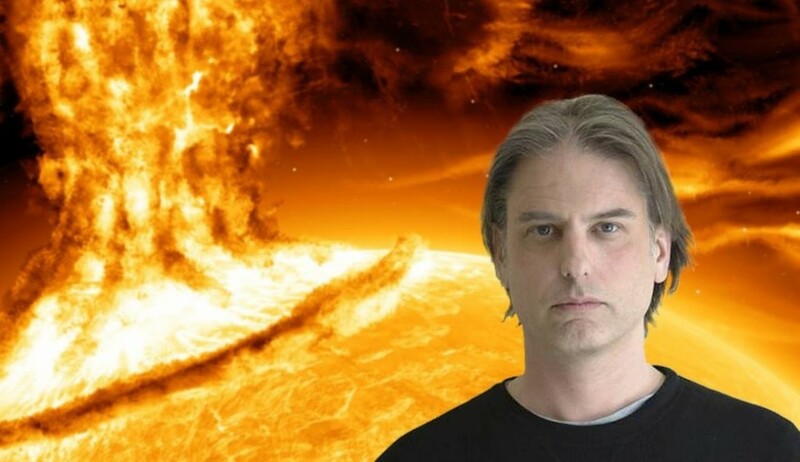 He specializes in very detailed historic research and has developed an encyclopedic knowledge of the astrology of hundreds of famous people and events. Nick is a regular speaker at conferences and workshops and is also a regular contributor to the Political Astrology Blog and Celebrity Astrology Blog. The title of his website tells of his interest in bringing astrology out of the sandal-wearing hippie era, and making it more relevant to the practicalities of modern life: Exoteric Astrology “Be your own damn guru!”. Nick is what I have been referring to lately as a “leading internet astrologer” because of his interaction with others on social networking sites such as Facebook, and his engagement with readers of his blogs through the comments. For this interpretation of the horoscope of Nick Dagan Best, I am using the time recorded on the birth certificate of 5:30 am (thanks Nick), though he has rectified the time as shown on his MySpace Profile. Nick is very popular, Marina calls him the “pin-up boy of astrology”. This rock star image is shown very well in his horoscope. Moon conjunct Midheaven is an indicator of fame because the Moon represents the public, and the Midheaven represent the public image, the status in the world. The Moon is conjunct a fixed star in the Head of the Ram called Mesarthim. Unlike the other stars in that area, it is Saturn-Mars in nature giving a less of the typical Aries head butting and more of the studious Saturn influence. This is supported by having Saturn widely conjunct the Moon. The popularity of Moon conjunct Midheaven is supported by Mesarthim being the marker for the 27th Hindu Moon Mansion Asvini “polite, fond of ornaments, handsome, popular and intelligent.” Yet another indication of popularity comes from the trine from the Moon to Mercury. More than the wide trine however, it is the influence of the fixed star Regulus on Mercury which increases the public appeal, and hints at success “Honorable, just, popular, generosity abused by opponents, fame, gain through high position.” So there is the conjunction of Moon and Midheaven, the Hindu Lunar Mansion, and Mercury on Regulus all saying the same thing, popularity, fame in fact. Regulus is also associated astrology. Mercury there is the traditional ruler of astrology. The modern ruler of astrology is Uranus, which is prominent in the chart for a number of reasons. Firstly, Uranus is on the fixed star Zavijava “Reliable worker, attentive to every detail of the job, will make a good sales rep”. One of the very tightest aspects in the chart is Moon biquintile Uranus at 17 minutes orb. The biquintile (144 degrees) is an ” indication of uncommon creative energy and talent. They are trend-setters and need an audience. The energy here is specialized and purposely striving toward power.” [Angle on Aspects]. We can see the results of this Moon Uranus biquintile in Nick’s independent, unique and creative style of astrology, which I expect is aided by flashes of insight and intuitive breakthroughs. Now we are at Uranus we come to the major aspect pattern in the chart, the Yod from Saturn to the Uranus Neptune sextile. Saturn is quincunx both Uranus and Neptune. The sextile is wide in orb but because of its involvement in the Yod it is strengthened. This sextile further supports the recurring theme of creative intuition which has allowed Nick to create his own unique and appealing style of astrology. Uranus is awareness and Neptune is mystical, so even though the astrology is practical based, there must be some mystical insights to help get it that way. Jupiter is on the fixed star Zosma “The ability to prophesy”. The real source of the practical manifestation of the inspirational creativity is Saturn, the action point of the Yod. Saturn here acts as the grounding influence, it brings the intuitive knowledge down to earth to be presented in a methodical manner, based on serious research. Neptune on the fixed star Agena suggests some difficulties along the way with “obstacles to success” but Saturn is working hard, and is the stronger influence being the action point of the Yod, the mission in life which will always be the driving force. Saturn on the fixed star Al Pherg “gives preparedness, steadiness, determination and final success”. I like reading about astrologers’ charts. Where did you find the “buzz this” button? hi Michelle, there is a new WordPress plugin , i just searched “google buzz” in the plugin section.